Straight from the depths of my pantry and freezer to you this week comes the Mexican Chicken Bake. Life is busy here at the bungalow. Vacations are ahead, the husband is busy with classes, I'm busy at work, the pugs are busy sleeping. The budget is tight this month because of said vacations so this is around the time I start looking through the pantry and the freezer for inspiration. Sounds silly, but if you're looking to save money on food, keep a well-stocked pantry of the basics and you'll, cue Scarlett O'Hara, "Never go hungry again." Fear not, dear readers, I'm planning a whole series on stocking up in general and for winter once the snow finishes receding and the green starts popping out of the ground. I usually end up doing one pantry or freezer meal a week because of all of our crazy schedules in this house. I mean, the pugs MUST sleep 12-18 hours a day, they have to, it keeps them cute. Side note and tip here is that if you have a massive roasting chicken or a rotisserie one you picked up from the store, you don't have to use it all right away. Pick all the yummy parts of the chicken off the bones, shred and chop and put what you don't use into a tough freezer bag or container. You can freeze that meat for a couple of weeks. When you want to use it, take it out the night before, or in the morning before you go to work, put it in your fridge and it'll be defrosted by the time you come home for an easy weeknight meal. The best part of this recipe is you can adapt it however you like. Don't like olives (I eat them straight form whatever container they come in)? Leave them out. Want more heat? Add some jalapenos to the mix. 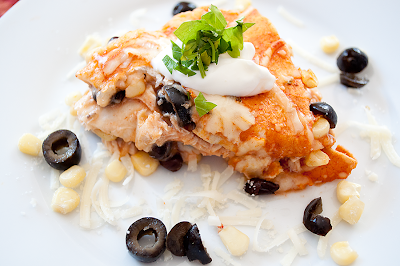 You can change up the cheese involved or swap red enchilada sauce for green. This is about whatever you may have lurking in your freezer or in the pantry, so feel free to change it up and get creative. If you find a winning combination, come back and leave me a comment so I can try it! 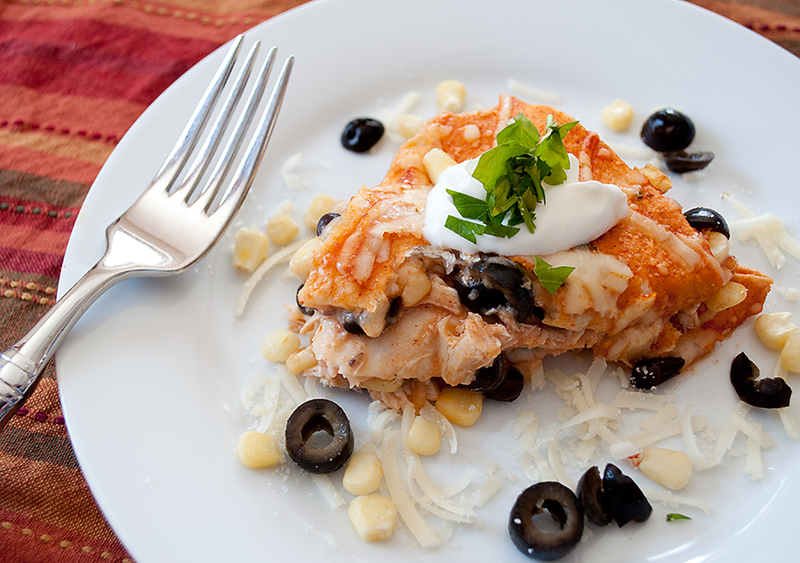 In large a bowl, combine chicken, red onion, black olives, 1/3 cup sour cream and 1/3 cup enchilada sauce and toss to coat the chicken. Now, spray a square baking dish with cooking spray and pour a little bit of the enchilada sauce to coat the bottom. Place one tortilla in the dish, cover with the chicken mixture, sprinkle on black beans, corn, and then drizzle a little bit of enchilada sauce over it all. Next, sprinkle your shredded cheese over that layer and place another tortilla on top. Repeat for two more layers. Place the last tortilla on top of the pile, pour the rest of your enchilada sauce over the top. Finish off with remaining cheese and pop that tortilla stack into the oven. Bake for about 30 minutes, until the top is a tad golden. Take out, allow to cool for 5 minutes or so before serving it up! Oh yes, this is goooood! I love these kind of meals. Great recipe! Love pantry meals, thanks for giving some inspiration for dinner this week!